An emergency landing following an oxygen bottle explosion and decompression of the airplane has spawned a so-far unsuccessful hunt for the cause. So far, investigators have looked at the bursting strength of the steel oxygen bottles; they have not yet explored the possibility of water vapor in the bottle, and its contribution to corrosion, which led to the container’s catastrophic loss. Think “moisture in bottle plus pure oxygen” and what could then happen’ i.e., accelerated corrosion. 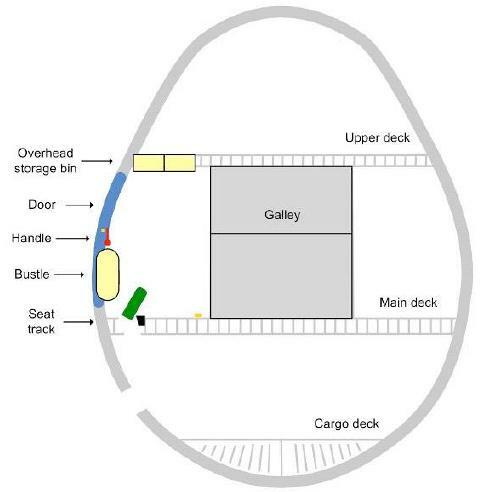 The Australian Transport Safety Bureau (ATSB) released earlier this month an interim report into the July 2008 accident, which involved a Qantas B747-400 flying from Hong Kong to Melbourne at 29,000 feet. About 375 miles northwest of Manila, there was a loud “BANG” followed by rapid depressurization and deployment of oxygen masks from stowage compartments above the seats. 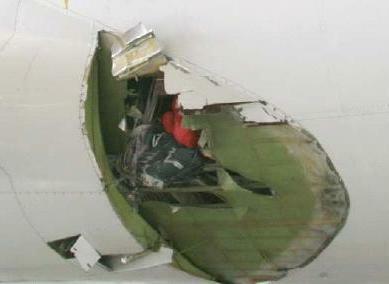 External damage sustained by the aircraft. The flight crew declared “Mayday” and conducted an emergency landing at Manila. Other than ear discomfort and the feeling of light-headedness, there were no injuries. Once on the ground, the extent of damage was apparent. 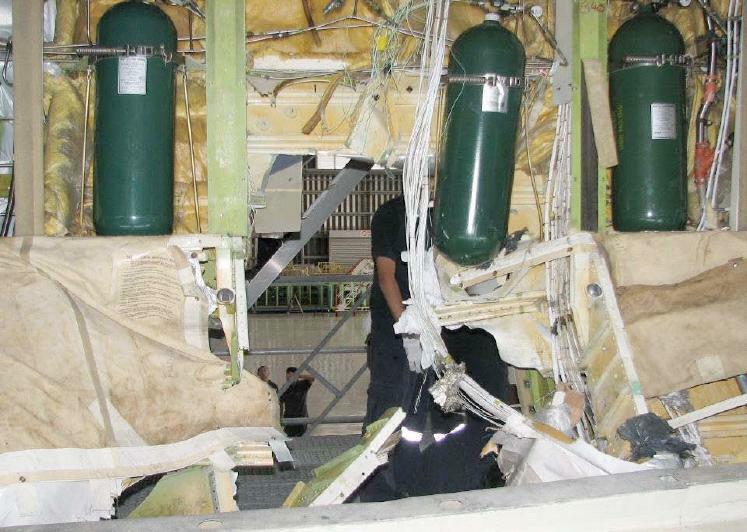 One of seven emergency oxygen cylinders installed in a bank along the right side of the aircraft’s forward cargo hold, the number 4 cylinder was found missing, with a large hole in the cabin floor and a rupture in the fuselage just forward of the main wing root. 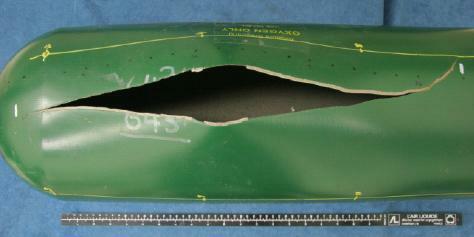 The burst cylinder had rocketed through the floor, then down and out through the fuselage. The cylinder was never recovered. The missing cylinder; note hole to outside. When the cylinder burst, it penetrated the cabin, bouncing off overhead bins before falling through the hole it had punched in the floor and exiting the hole made in the fuselage by the initial burst. In this hydrostatic testing, three cylinders from the same manufacturing lot were pressurized repeatedly to the point that a leak or burst occurred. The testing occurred in a water jacket to contain the effects, hence the term “hydrostatic” trials. One cylinder leaked at 4,200 psi. Another burst at 4,400 psi, and the third burst at 5,000 psi. The cylinders are normally pressurized to about 3,000 psi. After being pressurized to 3,000 psi, test cylinders were then subjected to overpressures of 4,400-5,000 psi until failure. Further testing will introduce machine external flaws on the cylinders. So far, the ATSB has not examined the effect of internal corrosion. At this point, no one is denying that the burst bottle now at the bottom of the Pacific may have been one accidentally filled with nitrogen by Qantas more than a year ago. When the error was discovered, the bottles were purged and filled with oxygen. Oxygen tanks have different fittings than other gases to prevent exactly this kind of mix-up. However, when the mechanics discovered that the fittings on what they thought was their new oxygen cart didn’t fit, they swapped them for the ones on the old cart that was being retired. Before the mistake was discovered, some 51 jets were serviced with nitrogen instead of oxygen. Just how serious was this maintenance mistake? Above 25,000 feet and one pilot leaves the cockpit for a bathroom break, the remaining pilot must don his oxygen mask. Oxygen masks are also donned in emergency situations like an explosive cabin depressurization or smoke in the cockpit. Since the cockpit oxygen is used more frequently than the passenger oxygen bottles, they are topped off more frequently. 2. A minute or so after donning the mask, the pilot notices his motor and cognitive functions are rapidly deteriorating. In an effort to get help, he drunkenly moves the flight controls or kicks off the autopilot while fighting to stay conscious. The aircraft goes out of control. Result: many fatalities. This is why, when the erroneous oxygen fittings were found on the nitrogen cart, a major effort was undertaken to purge all bottles that had been topped off with nitrogen gas. An important distinction needs to be made. Were the bottles purged of nitrogen but never checked for residual moisture when the nitrogen was replaced with aviation quality dry breathing oxygen? One could argue that the time taken for accelerated corrosion in an all pure oxygen atmosphere equates well with this incident. The clincher is that aircraft refill nitrogen isn’t dehumidified (like aviation’s dry breathing oxygen is). Thus, moisture in the bottle plus pure oxygen led to accelerated internal corrosion. When the bottle burst, shards of it ripped through a bundle of 85 wires. Many circuits were disrupted, including the right wing leading-edge slat drive, the right outboard trailing-edge flap control and asymmetry protection system, and the right landing gear anti-skid system. “Passenger address tape reproducer – the automatically-activated system for addressing passengers in the event of a depressurization did not function, requiring cabin crew to remove their own masks to shout instructions for passengers to stay seated, fasten seat-belts and use the deployed oxygen masks. While the ATSB investigation continues, Qantas already has revised its flight crew emergency procedures, including the introduction of a new depressurization checklist.